Musician, pannist, composer and steel pan arranger, Duvone Dwayne Stewart was born on September 17th, 1976 in the beautiful island of Tobago; the smaller of two islands that make up the Republic of Trinidad and Tobago. Born into a humble middle class family with strong Christian values, Duvone progressed and completed his academic pursuits in Tobago, with the completion of his last two high school years at Signal Hill Senior Comprehensive School. Despite Stewart’s Christian upbringing, his parents Curtis and Virginia Percival, who were both musicians, felt that only wide exposure to the artform would create avenues that would allow their children to develop holistically. Consequently, his parents allowed Stewart and his brother to be tutored in Music. Stewart began his musical career at the tender age of six (6). Under the Theroy and Practical Music instruction of Mrs. Gwyneth Armstrong, he performed creditably at Trinity Music Exams- an initiative of the London School of Music. After accompanying his parents to a steel orchestra practice one Saturday evening, Stewart reported that he picked up a pair of tenor pan sticks and the rest was history. To his and everyone’s delight, that moment marked a connection that would transform Duvone’s life forever. In less than two hours of playing around with the instrument, he was able to play “Mary Had A Little Lamb” with his eyes closed – an early feat and outlet for expression for an otherwise shy young boy that foretold the prodigy that would later develop. 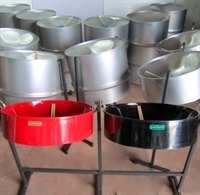 At the age of eight (8), Stewart started playing with the “TRINTOC TOBAGO ALL STARS STEEL ORCHESTRA” where he learned to master the instrument. His debut on the steel pan came in 1986 at the age of ten (10). Stewart won the ‘Trinidad and Tobago 12 & Under Children’s Competition’. 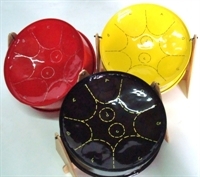 Stewart’s success in this competition inspired him to enter the ‘Trinidad and Tobago Steel Pan Junior Soloist Competition’ in 1987 and two other competitions the following year. Stewart had two resounding victories in both the ‘Trinidad and Tobago Teen Talent Competition’ as well as ‘Tobago Music Festival’. His acclaimed adroitness and competence on the instrument, were highlighted as he garnered first (1st) place in the ‘Trinidad and Tobago San Fernando Music Festival’ from 1989-1991, after which he was given the opportunity to participate in a regional tour. He visited St. Lucia, Antigua, Barbados, Grenada, St. Marten, and Montserrat, and following his first Caribbean tour continued to showcase his talent, excelling and gaining critical recognition at the National level. As Stewart continued to excel in field of Music, he decided to enter the ‘World Steel Pan Festival’ in 1993 as a soloist ,where he placed fifth (5th).On his eighteenth (18th) birthday, Stewart decided to relocate to Trinidad, as he felt that there were greater opportunities for him to master his art. Stewart became a member of the AMOCO Renegades Steel Orchestra. At this juncture in Stewart’s life, he began to study the styles of famous Local Musicians such as: Len ‘Boogsie’ Sharpe, Dr, Jit Samaroo, Clive Bradley, Robert Greenidge, Earl Brooks, Leon .Smooth. Edwards, Professor Ken Philmore and many others. In 1997, twenty one (21) year old Stewart made his first appearance outside the Caribbean as a part of Lincoln Enterprise Ensemble, representing Trinidad and Tobago in a tour of Columbia. 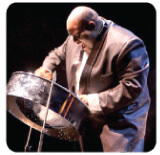 From 1998 to 2002, Stewart repeated his appearances, as well as his victories at the ‘Trinidad and Tobago Pan Ramajay Soloist Competition’ and the ‘World Steel Pan Festival’. Stewart showed remarkable potential and depth for a young performer. He not only impressed audiences with his showmanship and skill, but with his humility on and off the stage. After achieving all that was humanly possible in the realm of soloing in Trinidad and Tobago, he retired as a soloist in 2002, with the goal of giving other upcoming pannist opportunities to master the art form through competition. Stewart started to arrange in 2000 with his own band the NFM Pantasy, a six piece steel ensemble. This band has toured Asia, Europe and North America. In 2001, Stewart was endowed with the opportunity to arrange for La Horquetta (L. H.) Pan Groove, and is currently the only arranger in the history of Trinidad and Tobago’s National Panorama Competition that has won four successive Panorama titles. Only Seven years in the arranging circuit, he has captured first place eleven times between the different competitions. In Stewart’s short but memorable stint as an arranger, he has arranged for many bands in Trinidad and Tobago including Merrytones, Solo Pan Knights, and Our Boys Steel Orchestra. In the international arena, Stewart has arranged for Harmony Steel Orchestra in New York ;Calypso Atlantic in France; Steel Pan de Montangac in France; ‘Big Pan’ Pan Groove in Germany; and Piton Diamond Steel Orchestra in St. Lucia. Indelibly etched in the walls of Stewart’s mind, is his performance for Nelson Mandela in 2004 on his visit to Trinidad and Tobago. He still recalls the memory of the historic figure shaking and dancing to his music as one of the highest honours in his life and to this day one of the greatest milestones in his career. In his 24 years of playing, Stewart has shared stages and performed with the likes of Len Boogsie Sharpe, Ken Philmore, Jit Samarro, Earl Brooks, Mavis John, Mark Mosca (Canada), Black Stalin, Gabriel Sandy (Cuba), De Fosto, Arturo Tappin (Barbados). Orange Sky, Mario Canonge (France), Tangorra (France), Monty Alexander (Jamaica), Andy Narell (U.S.A), Karl Davis (U.S.A), Bobby Carcasses (Cuba), Bunji Garlin, Dane Gulston, Emmanuel Becks (France), T.K Blue (U.S.A), Randy Weston (U.S.A). Carlton Zanda, Son De Mass (Cuba), Swing Jazz Band (Germany), Ray Holman, Emmanuel Becks (France), Sean Thomas, Clive Zanda and John Arnold, German Swing Band. His vast range and repertoire of performances also includes many hits from renowned artists including: Beethoven, Michael Jackson, James Brown, Elvis Presley, Elton John and many more. He has also lectured and performed in Jamaica, United Kingdom, United States of America Maldives, France, Germany, Japan and Morocco. Now based in Nantes, France, Stewart’s persistence, vivacious nature, humility, showmanship and competence on the steel pan continue to allow him to reap benefits and make contributions that have propelled steel pan music and the steel pan movement to a higher level. With goals of starting a non-profit foundation in his native Trinidad & Tobago, his personal mission statement that “Music is a mission, not a competition” is a telling indicator of his maturity, and urges all musicians to believe in the beauty of their dreams and strive for excellence at ALL times. Panland Trinidad and Tobago Limited. Copyright Â© 2010. All rights reserved.